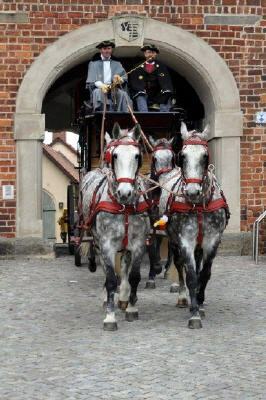 In spring 2017 you may book a day trip to Brandenburg with horse drawn coach. It´s exclusive and you'll be off the beaten path old post and trade routes to get to know. The tour will be led by our archaeologists. You drive from Bad Belzig from mostly on old field and forest paths on the Hagelberg , the highest peak in the High Fläming . There you will visit the summit cross and the historic battlefield of the wars of liberation of 1813. It continues through the varied , shaped by glacial landscape with its typical hills and valleys , past rolling fields , meadows and forests , the windmill of Borne. From there, the mail car finally reaches the landmarked army , trade and post road on which it then goes down in the friendly town of Bad Belzig . Your guide will look after you friendly while driving and cause knowledgeable. You drive mostly on old field and forest paths, as well as the listed army, trade and post road through the park Hoher Flaming. From Bad Belzig it goes to the castle Rabenstein and back to Bad Belzig. They enjoy a varied, shaped by glacial landscape with typical sinks and hills, past rolling fields and meadows, along creeks and through colorful forests. This tour is run by appointment from May to October from 10.00 clock of Bad Belzig. Take the monumental army , trade and post road through the park Hoher Flaming the same answer . From Bad Belzig Travel via Rabenstein Castle, the old border road and wait , to Lutherstadt Wittenberg . The mail coach follows after 150 -year hiatus that route , which was first used in 1703 by the anno -propelled Post Electorate . The heavy wheels dig some deep ruts in the sandy ground or jolt uphill and downhill over the ancient cobblestones. Almost straight leads the old way by an extremely varied landscape shaped by ice ages . We pass rolling fields and meadows , along creeks and through extensive forests . This tour is run by appointment from May to October from 10.00 clock of Bad Belzig . Note: From Wittenberg easily you can reach Berlin or Leipzig by train. If you want to stay in Wittenberg and stay there longer , we take care of your accommodation .